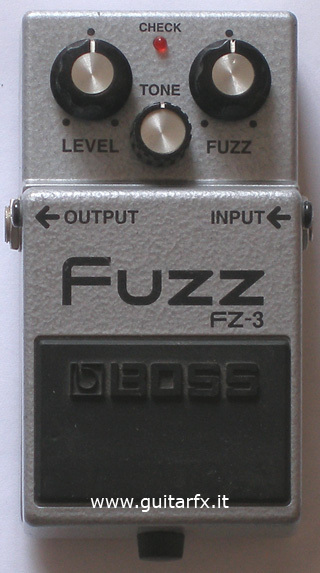 The FZ-3 is the 2nd fuzz in the line of compact Boss pedals (the first one is the FZ-2 Hyper Fuzz). It has been sold from 1997 to 1999, however it seems to me that finding an used one is not a problem. In Boss intentions, this pedal should have a classic ’60 sound, however I’m not sure if this can be considered true, since I don’t have any classic fuzz like the Maestro or Dallas Fuzzface available for comparison. As you can see in the above photo, the controls are very simple, and this is a deliberate step back from the FZ-2, which had more controls. This entry was written by admin, posted on October 17, 2009 at 10:42 pm, filed under Fuzz and tagged Boss, Fuzz, FZ-3, FZ3. Bookmark the permalink. Follow any comments here with the RSS feed for this post. Post a comment or leave a trackback.